WeissCANNON, a true innovator in the world of tennis string manufacturing, is highly respected due to the quality and diversity of the product line they have developed. 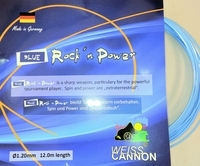 The awesome Blue Rock 'n Power is thinner cousin of the super successful Ultra Cable. The edges are even sharper and devour fuzz even more. Construction: WeissCANNON's new hyper-poly composite offers tremendous feel and controllable power and with the aggressive 4-sided razor design...ridiculous spin. Advantage: Sharp edged strings, especially those with the aggressive 4-sided design, have previously been impressive at producing some eye-popping spin, but not as strong in terms of overall feel and quality of play.